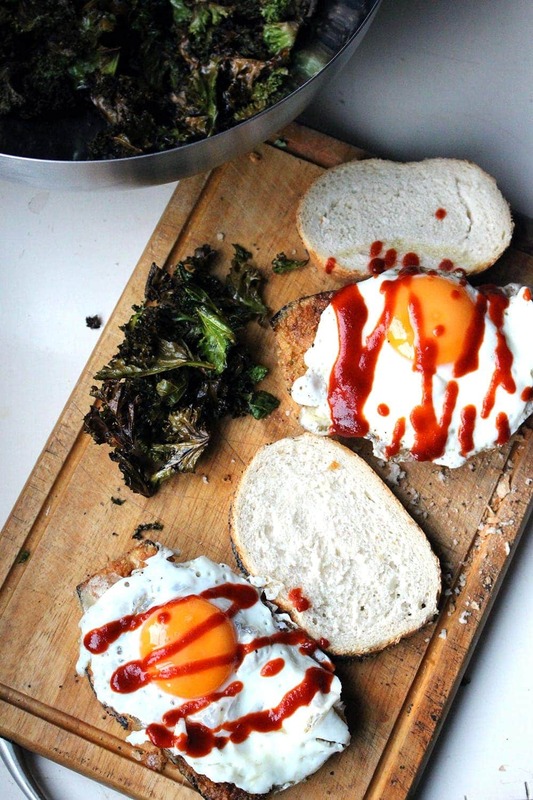 This panko aubergine & egg sandwich with kale chips is a delicious vegetarian meal which works at any time of day. Will’s away this weekend so I’m currently sitting in my pyjamas (at 3.30 in the afternoon) watching the marathon, the final athletics of the Olympics, feeling extremely sorry for myself that it’s all nearly over. Endings have never been my thing. I used to cry at the end of every birthday and Christmas day because I just couldn’t bear the thought that I had to wait another year for it to come back round again. And this is even worse, four whole years until I get to watch the Olympics again, so sad. It’s been two weeks full of so much excitement and so much to be proud of in British sport. The thing that filled my heart up the most was the diversity of our athletes. People from all different backgrounds, races, parts of the country, doing their absolute best and being very inspiring. Anyway, enough of me being sappy about the Olympics! I’d been thinking about breading aubergine for something for a while which is what lead to this panko aubergine and I knew there needed to be sriracha involved because, well, sriracha goes with crispy fried things just excellently. I was a little worried that the aubergine would get kind of soggy and oily as aubergine is wont to do but it actually worked out fine, you just need to make sure to salt the aubergine slices thoroughly first so the moisture is drawn out. Then when you bread them and shallow fry them they end up totally crispy especially if you shove them in the oven for a few minutes before serving. I also took the liberty of topping them with a few slices of cheese during their last few minutes in the oven. Basically I decided that the fact I was eating the sandwiches with kale chips meant that I could use as much cheese as I wanted. Obviously. So let’s talk about the kale chips. Let’s be honest they’re not the usual fare you’d find here on The Cook Report but we had some kale leftover from a pasta dish we had a few days ago and this seemed like a great way to use it up. They’re super easy and I added one of our absolute favourite spices, smoked paprika, to make them taste great. 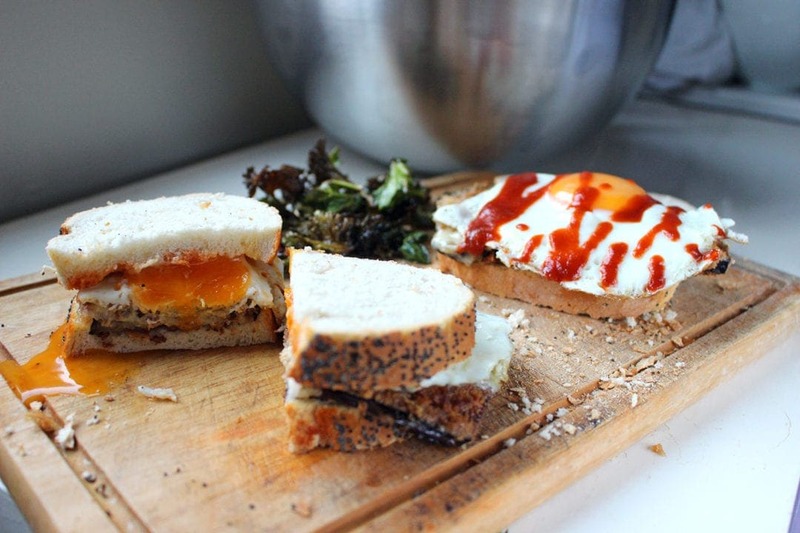 After topping the aubergine and cheese with a perfectly runny fried egg it just took a drizzle of sriracha and another slice of bread to finish off the sandwiches. I bought some poppy seed bread to use for this. Fresh bread is always such a treat. My parents have nice bread at home all the time but Will and I don’t really eat much bread so I don’t get the treat of fancy loaves very often. Cut the aubergine long ways. Place on kitchen roll and salt liberally to draw out the liquid. Leave for 10 mins. Heat oil over medium-high heat. Preheat oven to 180°C. 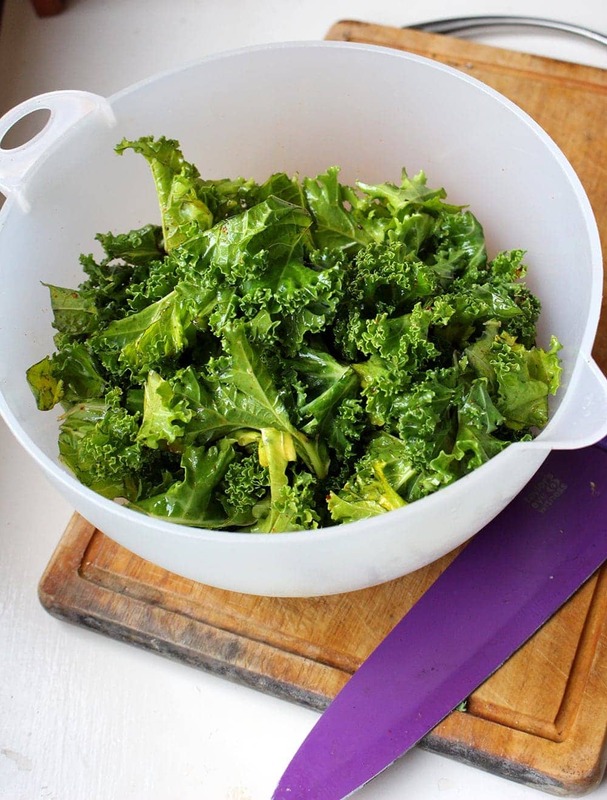 Prepare the kale - remove stems, chop, place in a large bowl with a drizzle of olive oil, salt, pepper, smoked paprika and massage until coated. Place in a single layer on baking trays and set aside. Pat dry the aubergine. Lay out three bowls, one with the flour seasoned with salt and pepper, one with the beaten egg and one with the breadcrumbs. Coat each slice of aubergine with the flour followed by egg and then breadcrumbs before frying for 3-4 minutes on each side until golden brown. Remove from the oil and place on kitchen roll to drain. Once all of the aubergine is cooked place on a baking tray and put into the oven along with the kale for about 10 minutes. Remove the aubergine, place the slices of cheese on top and return to the oven for 5 minutes. Heat a little more oil over a medium heat (I just drained off the oil I used for the aubergine and used the same pan). 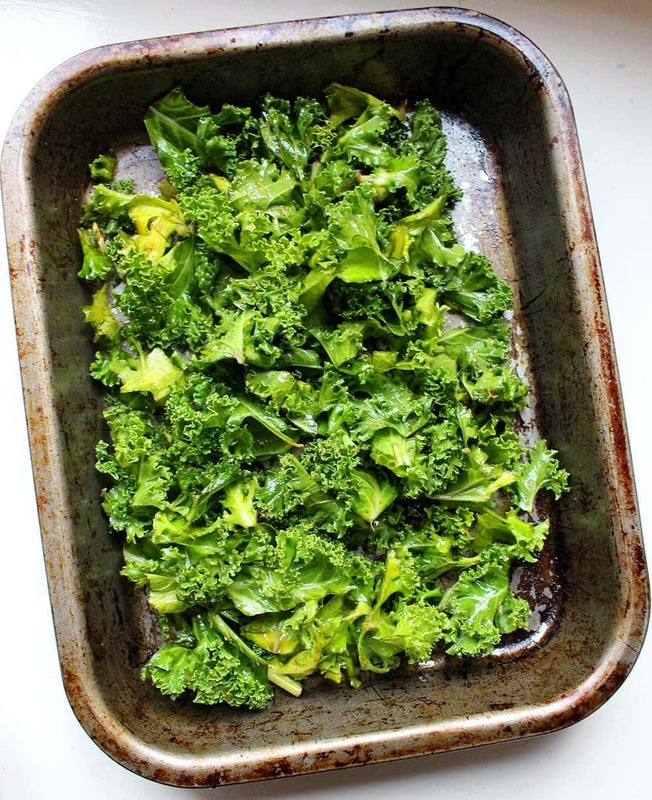 Remove the aubergine and kale from the oven. 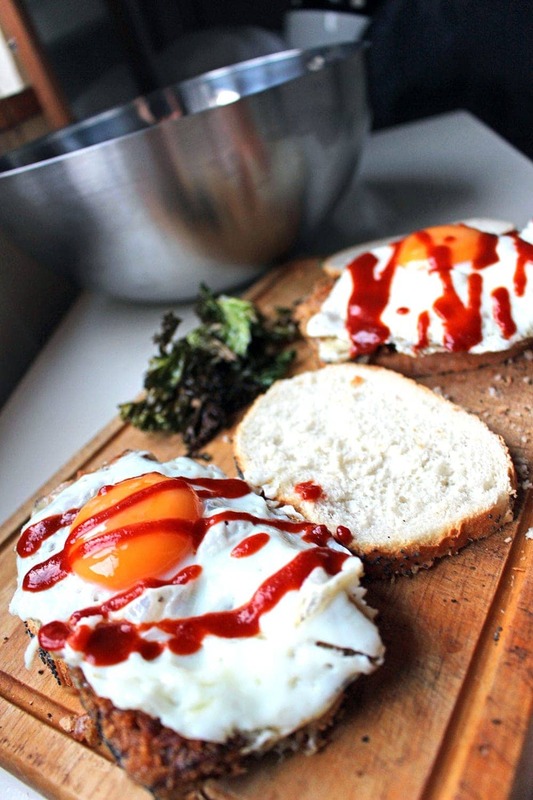 Crack your eggs into the pan and fry until cooked to your liking. Assemble the sandwiches. 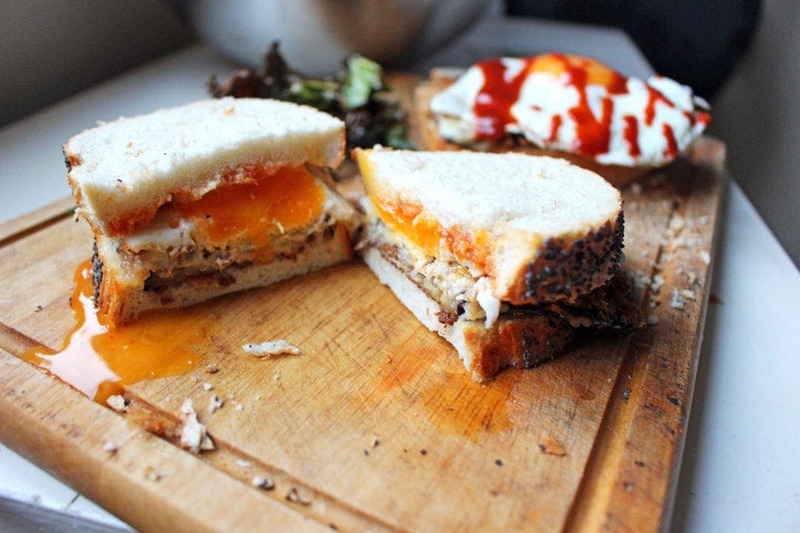 Place a piece of aubergine and cheese on to each slice of bread followed by the fried egg and a good squeeze of sriracha. Serve with kale chips on the side. 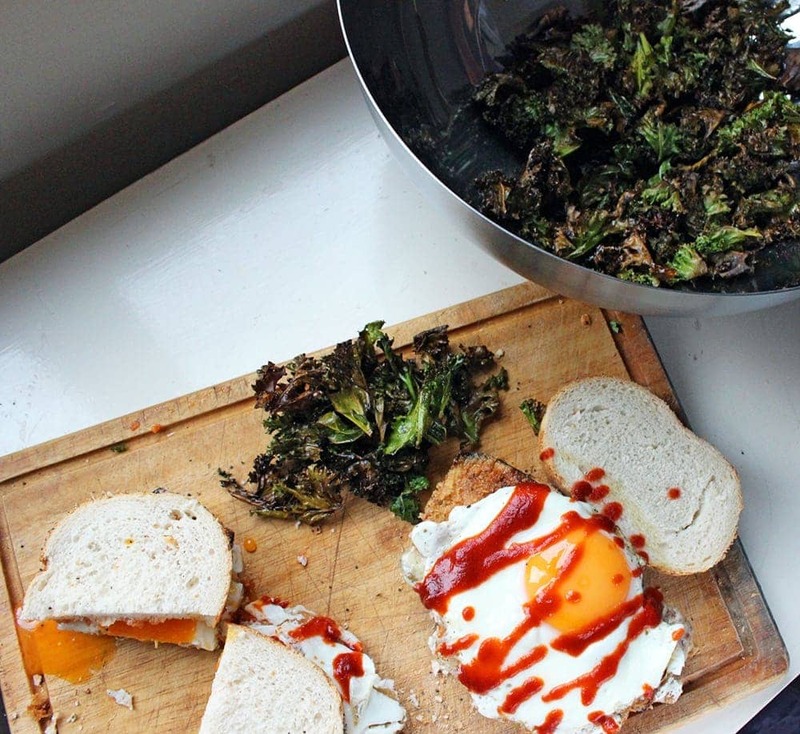 WONDERING WHAT TO DO WITH THE LEFTOVER INGREDIENTS YOU’VE GOT FROM MAKING THIS Panko aubergine & egg sandwiches with kale chips? You can find some brilliant uses for eggs in this harissa polenta with eggs and feta or in this potato, bacon and mushroom hash. 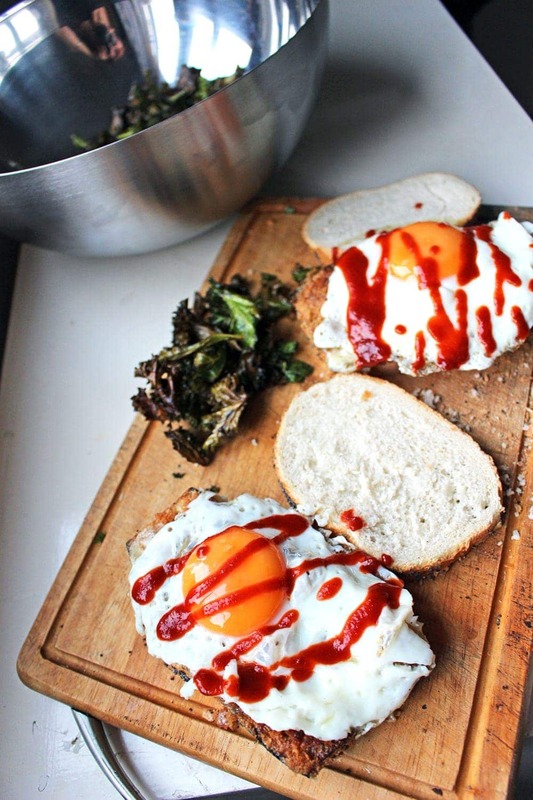 If you weren’t convinced about buying that bottle of sriracha, you can use it with this buttermilk fried chicken sandwich or this courgette and carrot stir fry.